Place markers to highlight certain individuals, family lines, events, etc. Select from a list of place markers of varying shapes and colors or import one or more images to use as custom place markers. Automatic links to Google™ Maps, Google Earth and TerraServer USA so you can see your ancestral home towns on online maps, satellite images and aerial photographs. As with previous versions, Version 1.2 also includes an automatic link to MapQuest.com. Ability to print or publish your map as a PDF document. Time scrolling tool bar so you can dynamically select which time period is displayed on the map. As you slide the thumbtrack along the scroll bar, you will see the towns "twinkling" to show the movements, voyages and migrations of your ancestors. Filters to display specific people and events from your genealogy database. You can filter by name, ancestor line, descendant line, date, event type and gender. This is especially helpful when you want to create maps with single family lines, births only, events from a specific time period, etc. See your ancestors' lives on a map with this new one-of-a-kind mapping software. 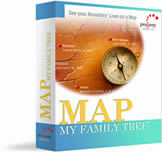 Map My Family Tree™ is a revolutionary genealogy mapping product that presents your ancestors’ lives on a map. Map My Family Tree reads your Legacy Family Tree file directly and automatically plots all ancestral life events on customizable color maps. This allows you to see where your ancestors were born, married and died. Track family migrations using the world and country maps. 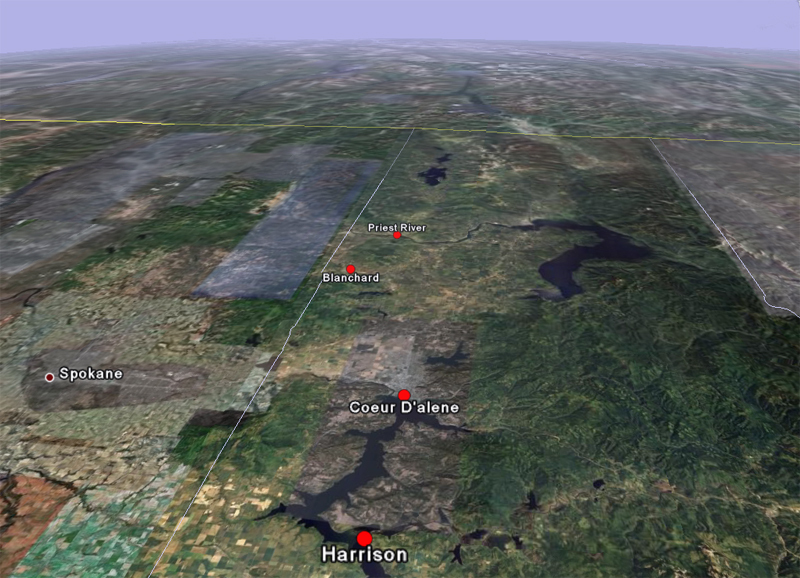 Then zoom into any part of the world to see detailed events in that particular location. You can choose from 15 different map styles included with the software or customize your maps with over 16-million colors and a wide range of font styles and sizes. Print your maps on a wide variety of paper sizes and/or electronically publish them to display on websites or email to family and friends. Click here to see screen shots showing how Map My Family Tree works. 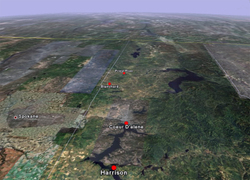 Automatic links to Google™ Maps, Google Earth, TerraServer USA and MapQuest.com so you can see your ancestral home towns on online maps, satellite images and aerial photographs. Ability to print or publish your map in a variety of electronic formats, including PDF, JPG, BMP, GIF, PNG and TIFF. Map My Family Tree also automatically checks your genealogy database for place name typos, missing counties and other inaccuracies. You may then copy and paste corrections to your genealogy file. Plus you can look up over 3.3-million place names from around the world, including over 100,000 US churches and cemeteries. This is especially helpful when you’re not sure how to spell Great Grandma’s home town or know which county she lived in. 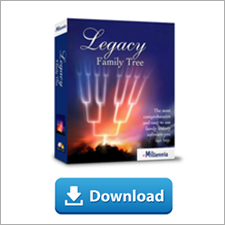 Map My Family Tree reads your Legacy family file directly, so you do not have to import a GEDCOM. 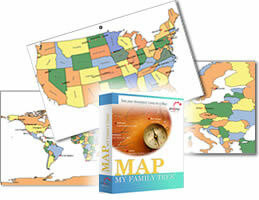 Priced at only $39.95 US, Map My Family Tree is available only on CD-ROM due to the very large database of place names. Click here to place your order. 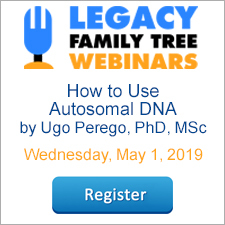 A must-have for any novice and experienced genealogist, Map My Family Tree is an incredibly useful program to see your ancestors’ lives in an entirely new way. Life is a journey - and now with Map My Family Tree you can trace your ancestors’ journeys and gain a whole new perspective of your family history.